Tuesday 29 January, first competition day of the Hempel World Cup Miami. All ten classes were scheduled to race. Light winds early on meant some short postponements, but racing finally got underway in Southerly, 7 to 9 knot breeze, but some fleets did not complete all their races. 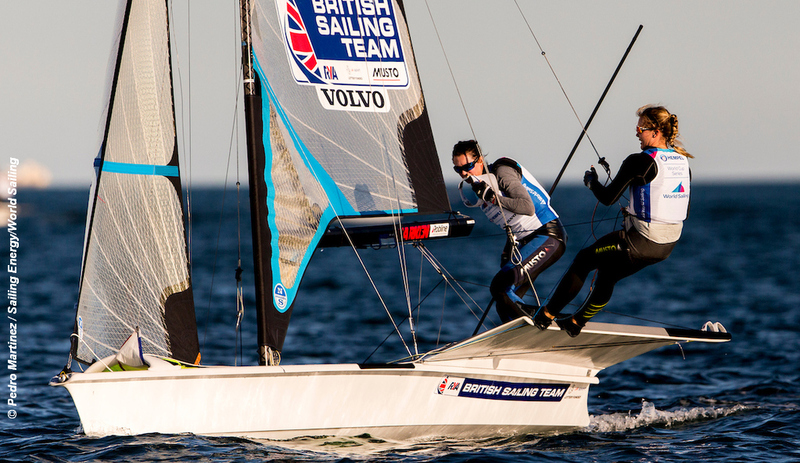 For the Britsih Sailing Team the stand-outs were, James Peters and Finn Sterritt in the 49er winning the second race after a 20th in the first and then a third place in the final race put them top of the leaderboard. Sophie Weguelin and Sophie Ainsworth winning the single 49erFX race that was sailed. And in the Nacra17, John Gimson and Anna Burnet taking three steady results to place 5th overall. Racing resumes on Wednesday 30 January. The fleets who were unable to complete a full schedule of racing on Tuesday will sail an additional race, minus the Men’s and Women’s RS:X. Detailed results below may be subject to change . . .
Laser Men – Winner of the Yellow flight race 1, was Sam Meech NZL, 2nd George Gautrey NZL and 3rd Hermann Tomasgaard NOR. Best GBR were Jack Wetherell in 11th and Elliott Hanson 26th. Seems that Britain’s #1, Nick Thompson is not racing in Miami. The second Yellow flight race was won by Hermann Tomasgaard NOR with Meech second and third Josh Armit NZL. Winner of the shortened Blue flight race 1, was William De Smet BEL, with 2nd Tom Burtom AUS, and 3rd Thomas Saunders NZL. Best GBR were 10th Lorenzo Chiavarini and in 20th Mike Beckett. In the second blue flight race 1st was Yuri Hummel NED, 2nd Joaquín Blanco ESP and 3rd Lorenzo Chiavarini GBR. Overall in the men’s Laser, 1st is Meech, 2nd Tomasgaard, and 3rd Matt Wearn AUS. In 6th place is Lorenzo Chiavarini of Britain. Women’s Radial managed just one race. 1st Dongshuang Zhang CHN, 2nd Zoe Thomson AUS, 3rd Anne-Marie Rindom DEN. Britain’s Alison Young was 5th and Hannah Snellgrove 8th. Men’s 470 – Race 1 went to Giacomo Ferrari and Giulio Calabrò ITA, 2nd Anton Dahlberg and Fredrick Bergstrom SWE, 3rd Stuart Mcnay and David Hughes USA. Britain’s Luke Patience and Chris Grub were 10th, and Martin Wrigley and James Taylor 16th. Race 2 won by Tetsuya Isozaki and Akira Takayanagi JPN, 2nd Carl-Fredrik Fock and Marcus Dackhammar SWE and in 3rd Dahlberg and Bergstrom. Best GBR were Luke Patience and Chris Grub in 14th place. Overall in the men’s 470, the leaders are Dahlberg and Bergstrom, 2nd Ferrari and Calabrò and 3rd Mcnay and Hughes. Britain’s Patience and Chris Grub are 8th overall and 19 points off the leader. 470 Women – Race 1 win for Agnieszka Skrzypulec and Charlie Bess POL, 2nd Benedetta Di Salle and Alessandra Dubbini ITA, and 3rd Fernanda Oliveira and Ana Luiza Barbachan BRA. Britain’s Hannah Mills and Eilidh McIntyre finished 17th. Race 2 was a second win for Skrzypulec and Bess, 2nd Mills and McIntyre, and 3rd Atlantic and Nora Brugman USA. Overall in the women’s 470, leaders are Skrzypulec and Bess, 2nd Fabienne Oster and Anastasiya Winkel GER, and 3rd Di Salle and Dubbini. The British pair Mills and McIntyre are 9th and 18 points off the lead. 49er Men – Race 1 won by Diego Botin and Iago Lopez ESP, 2nd Bart Lambrix and Pim Van Voight NED, 3rd Sime and Mihovil Fantela CRO. Best GBR in 6th place were Dylan Fletcher and Stuart Bithell, with James Peters and Finn Sterritt back in 20th. Race 2 won by Peters and Sterritt GBR, 2nd Mads Lübeck and Nikolaj Buhl DEN, with 3rd Jakob Meggendorfer and Andreas Spranger GER. Fletcher and Bithell were black flagged. Race 3 won by Marco Soffiatti and Gabriel Borges BRA, with 2nd Sime and MihovilFantela CRO, and 3rd Peters and Sterritt. Britain’s Fletcher and Bithell were 11th. 49er Men overall 1st James Peters and Finn Sterritt, 2nd Diego Botin and Iago Lopez and 3rd Sime and Mihovil Fantela. Dylan Fletcher and Stuart Bithell are 10th. RS:X Men – Race 1 – 1st Thomas Goyard FRA, 2nd Pawel Tarnowski POL and 3rd Pierre Le Coq FRA. Mathew Barton was best Brit in 12th, with Daniel Wilson 24th. Race 2 a win for Angel Granda-Roque ESP, 2nd Tao Li CHN and 3rd Mengfan Gao CHN. Overall leading the men’s RSX is, Granda-Roque tied on 9 points with Bing Ye CHN and 3rd Tarnowski. Best GBR is Daniel Wilson in 17th. RS:X Women – Race 1 won by Yunxiu Lu CHN, 2nd Flavia Tartaglini ITA, 3rd Yarden Isaak ISR. Best Brit was Emma Wilson in 14th, Saskia Sills was 23rd, Bryony Shaw was BFD. In the Finn race 1 – 1st Jonathan Lobert FRA, 2nd Josip Olujic CRO, 3rd Luke Muller USA. No GBR entry. Nacra 17 completed three races and the overall leaders are: 1st Samuel Albrecht and Gabriela Nicolino de Sá BRA, 2nd Jason Waterhouse and Lisa Darmanin NZL and 3rd Iker Martinez and Olga Maslivets. Britain’s John Gimson and Anna Burnet (6,2,8) are 5th overall. 49erFX Women – Just one race completed, which was won by Sophie Weguelin and Sophie Ainsworth (GBR) , 2nd Alex Maloney and Molly Meech (NZL) and 3rd Victoria Jurczok and Anika Lorenz (GER). Britain’s Charlotte Dobson and Saskia Tidey were BFD.